Carex is a vast genus o ower 1500 species o grassy plants in the faimily Cyperaceae, commonly kent as sedges. 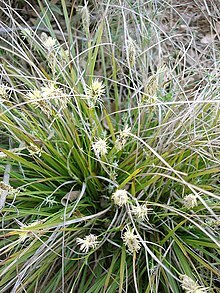 Ither members o the Cyperaceae faimily are an aa cried sedges, however those o genus Carex mey be cried "true" sedges, an it is the maist species-rich genus in the faimily. The study o Carex is kent as caricology. ↑ RHS A-Z encyclopedia of garden plants. United Kingdom: Dorling Kindersley. 2008. p. 1136. ISBN 1405332964. This page wis last eeditit on 25 Mairch 2015, at 05:19.